New Delhi: Not a sweep, nowhere close to its performance in the state in the 2014 Lok Sabha elections, but a win nonetheless. According to trends at noon on Monday, the BJP is leading in Gujarat in more than 100 seats, battling 22 years of anti-incumbency in the state, more than three years at the Centre and vulnerabilities such as the Patidar agitation, farmers’ discontent as well as impacts of GST and demonetisation. So far, according to the Election Commission’s statistics, the BJP is leading in 105 of the 182 seats with a vote share of 49 per cent, while the Congress is leading in 69 seats with 41.6 per cent vote share. In 2012, the BJP had won 115, while the Congress had bagged 60 seats. In broad region-wise trends, the BJP has suffered significant losses in the Saurashtra region, but has kept its hold over the others — central, north and south Gujarat. Compared to 2012, the party’s performance has dipped in Saurashtra, but it has made gains in the north where the Congress held more sway. The Patidar agitation clearly seems to have hurt the party, and helped the Congress. Discontent among farmers over inadequate prices of cotton and groundnut has also hurt the BJP. However, caste calculations as well as its post-floods relief work seem to have helped it in the north. The BJP has retained its urban base. Clearly, GST and demonetisation were not significant electoral issues. It is evident that PM Narendra Modi continues to remain popular in the state and this could help him ahead of the 2019 Lok Sabha elections. The Congress has increased its seat share, with adequate help from Hardik Patel’s traction in the Patidar community. Its newest find, OBC leader Alpesh Thakor, is leading in his constituency Radhanpur by a comfortable margin of over 12,000 votes. Dalit leader Jignesh Mevani, who fought as an independent supported by the Congress, is also leading by 18,000 votes in Vadgam. The Congress seems to be gaining a foothold in the BJP’s traditional bastion of Kutch, securing a lead in three of the six assembly seats in the region. The BJP had five legislators from the region, while the Congress had one in the outgoing assembly. In what may come as a shock to the BJP, Congress’ Adam Chaki has gained a resounding lead in Bhuj, the headquarters of Kutch, with a margin of 21,732 votes, according to EC figures as of 11.30 am. 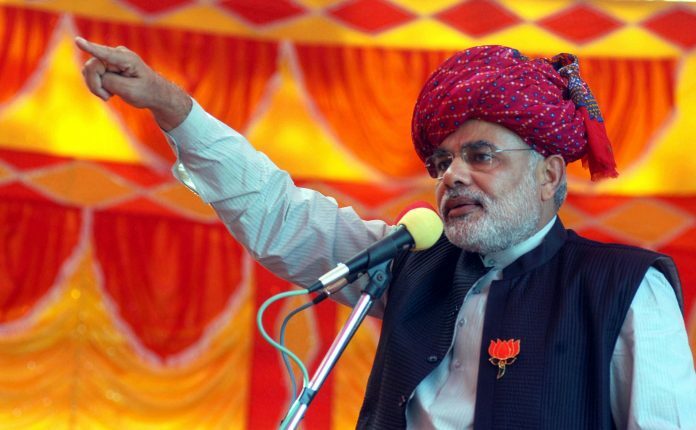 The assembly constituency of Bhuj, which has a 26 per cent Muslim population, has been with the BJP since 1990, barring one five-year term in the immediate aftermath of the 2001 earthquake. Congress’ lead in Bhuj also reflects the strong feeling of anti-incumbency that Muslims in the Kutch region feel. Many told ThePrint that they were disillusioned with the BJP due to lack of jobs, adequate water and a general feeling of neglect by the BJP’s local leadership. The BJP did not field a single Muslim candidate from the Kutch region, while the Congress fielded one — Adam Chaki. Other constituencies where the Congress has taken a lead over the BJP in Kutch so far include Abdasa, which is currently with the party with Congress’ Shaktisinh Gohil being the sitting legislator, and Rapar, which the BJP won in 2012 with a margin of 9,216 votes. The Congress’ ace candidate in the region, Gohil, who is this time contesting from Mandvi, is, however, trailing behind BJP’s Virendrasinh Jadeja by a margin of 5,104 votes.